Wouldn't you like to have all the Scriptures on an important Bible topics, such as marriage, end times, the Holy Spirit, or money management in one place? The MacArthur Topical Bible is the most user-friendly Bible study tool released in decades. It's a comprehensive volume of 20,000 Bible topics and more than 100,000 Bible passages, carefully cross-referenced and organized. Simply find a topic in the resource and read the related verse directly in the resource—just like the paper version. It's an amazing time-saver for teachers and pastors planning their lessons. Next to the Bible, this is the best companion a Christian can have for in-depth study of thousands of spiritual subjects. Articles can be accessed through the table of contents, and by a key word "look up" feature in the Resource Guide. 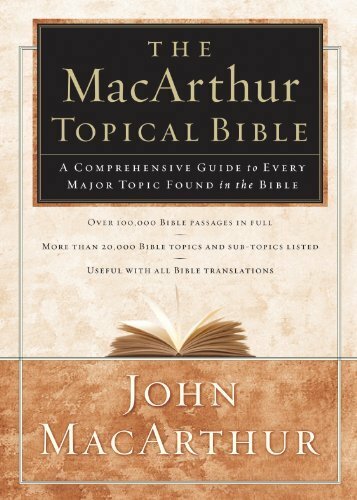 NOTE: The MacArthur Topical Bible product only contains the notes contained in the MacArthur Topical Bible.